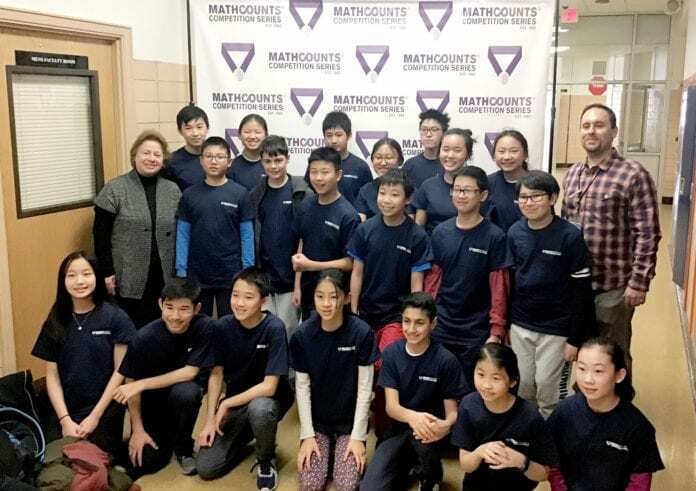 North Middle School hosted the 2019 Long Island MATHCOUNTS competition on Feb. 2, a regional contest which featured 15 schools from Nassau and Suffolk counties, including both Great Neck middle schools. The team from South Middle School finished in second place and qualified for the state-level competition. Team members are Brayden Chien, Charles Huang, Luke Huang, Jonathan Kogan, Eric Pei, Tristan Wan, Lillian Wang, Ashley Wei, Erin Wong, and Richard Zhuang. The team coach is Diane Hodgson, mathematics teacher at South Middle. The team from North Middle finished in seventh place. Members of the North Middle team are Junghyun Choi, Skyler Damaghi, Ryan Fu, Joy Huang, Julia Huang, Ryan Liu, William Okin, Adrian Shiu, Shuyuan (Julie) Sun, and Katherine Sun. The team coach is Zachary Boyt, mathematics department head at North Middle. Additionally, two South Middle students — eighth grader Tristan Wan and sixth grader Erin Wong — were among the top 12 of all participants, which qualified them to participate in the fast-paced Countdown Round. Tristan Wan took first-place in the Countdown Round, where students face off against one another to answer questions before their opponent. Team members who will represent South Middle at the state-level competition at Rensselaer Polytechnic Institute on March 9 are Jonathan Kogan, Tristan Wan, Eric Pei, Richard Zhuang, and alternate Lillian Wang. The MATHCOUNTS competition focuses on problem solving and mathematical reasoning through collaboration, with points awarded for speed and accuracy. It is sponsored by the MATHCOUNTS Foundation, a non-profit organization that provides engaging programs to middle schools across the country.